Prince Albert's many attractions are so varied there's something for absolutely everybody, from hikers and bikers, to bird watchers and botanists. It's an ideal environment for artists and writers and even the dedicated couch potato, and offers peace for stressed city-dwellers and visitors from the densely populated urban environment of Europe. The changing colours of the mountains, the mystery and magic of tiny veld plants and flowers, the rustle of small creatures, birds, butterflies, sun and stars, the clear air, Karoo sunshine and brilliant night skies make Prince Albert a place to restore the soul. Discover the village on a leisurely stroll or a guided walk. Pop into our art galleries, curio shops, weavery and tannery. Enjoy a snack or a meal at one of our coffee shops or popular restaurants. The cuisine ranges from good old fashioned Karoo cooking to Mediterranean fare - local produce, from prize-winning cheese to olives and tasty Karoo lamb. Admire the well-preserved architecture - the area boasts 18 National Monuments or visit local farms to see olive groves and fruit orchards. Life-giving water, flowing from springs in the Swartberg Mountains, make Prince Albert a small oasis in the Great Karoo. The Karoo geology is striking and the plains, valleys and peaks support a wide variety of plant species from fynbos to Karoo scrub. Fossils, bushman paintings and the last lingering evidence of our 1890's gold rush add romance to farm drives and hikes. Prince Albert lies at the foot of the Swartberg Mountains, offering spectacular day drives into the internationally renowned Swartberg Pass and Gamkaskloof - "The Hell," a remote valley in the depths of the Swartberg, where the community lived in isolation for more than 100 years and is now under the care of the CapeNature (conservation) Board. 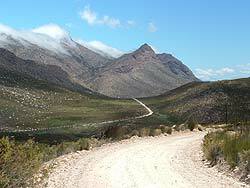 The Swartberg Pass was completed by engineering genius Thomas Bain in 1888 and is recognised as one of the finest in the world. 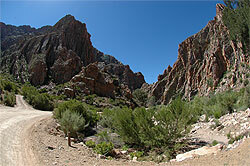 The drive along the gravel road reveals geological and botanical wonders while offering spectacular views. Prince Albert hosts a number of festivals, the best known being the annual Olive, Food and Wine Festival which usually takes place in early May. Sample some of our local delicacies such as sun-dried figs, olives, olive oil, cheese and wine and join in the many activities for young and old.